The Dutch Sinterklaas is accompanied by several helpers called Zwarte Piet, or Black Peter. 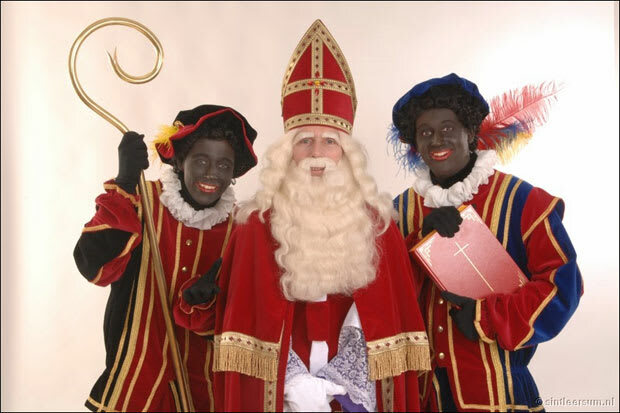 Until the 1950s they were described as Sinterklaas's slaves, but when the civil rights movement came around, they became his “friends,” who had become black from soot as they went down chimneys (Sinterklaas, however, maintains his pristine robes and snowy white beard). Despite this updated storyline, they are still wanting for political correctness. To this day, in shopping malls and holiday parties all over Holland, Zwarte Piet are portrayed by people painted in blackface. Some have raised issue with the racist overtones of the Zwarte Piet character, suggesting fixes from painting them rainbow colors rather than just black, to ditching them altogether.